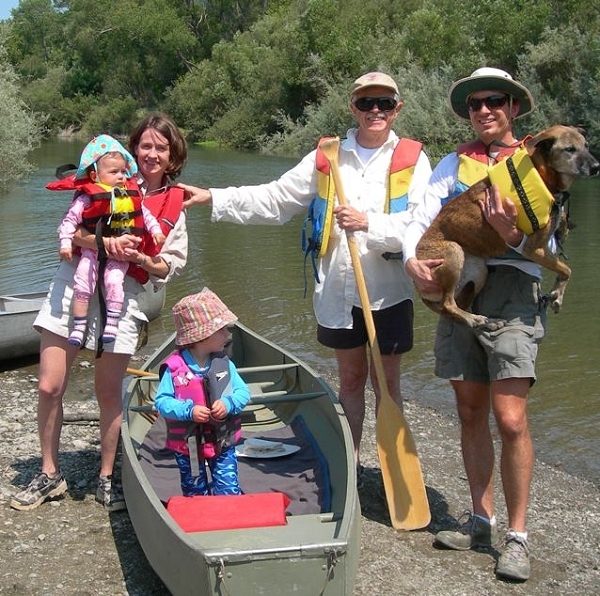 Greta, Deborah ('96), and Katharine Graham, Steve (Geezer) Spaulding, Andrew Graham and a hesitant Cassidy embarking on the wild Russian River. The expedition set out after lunch on Saturday, June 14, 2008. Katharine, Greta and Cassidy sat in the middle along with Andy, who kept them fed/amused/pacified. Deborah paddled skillfully in the bow with only the occasional crunch of gravel on the bottom as we drifted through shallows. The Geezer sat in the stern, watching ospreys and occasionally steering.